Dimensions: 11.34" x 8.15" x 12.91"
Digital EnergySmart technology with energy use indicator. Programmable thermostat & 2 heat settings. Tip Over Switch & Overheat Protection. 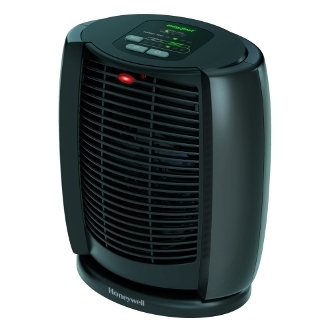 The Honeywell Deluxe EnergySmart Cool Touch Heater is an incredibly efficient heater that utilizes EnergySmart Technology to regulate power consumption while providing an indicator that displays overall energy usage. Ideal for heating large to wide areas of space, this unit comes with a programmable thermostat and two separate heat settings. The addition of safety enhancers such as a Cool Touch Safety Grille, Tip Over Switch and Overheat Protection exceed Industry Safety Standards while reassuring absolute peace of mind. User friendly controls, efficient heating and a focused attention on safety make this a versatile unit that can be implemented in any number of settings.